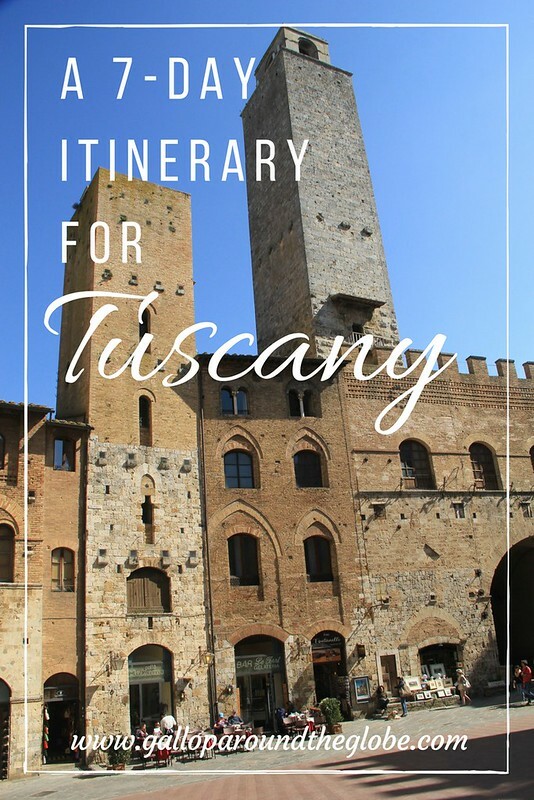 Those of you who read my 2017 Travel Plans, Goals, and Aspirations post will know that my decision to book a 7-day trip to Tuscany with my mum was a result of a personal tragedy in our lives. 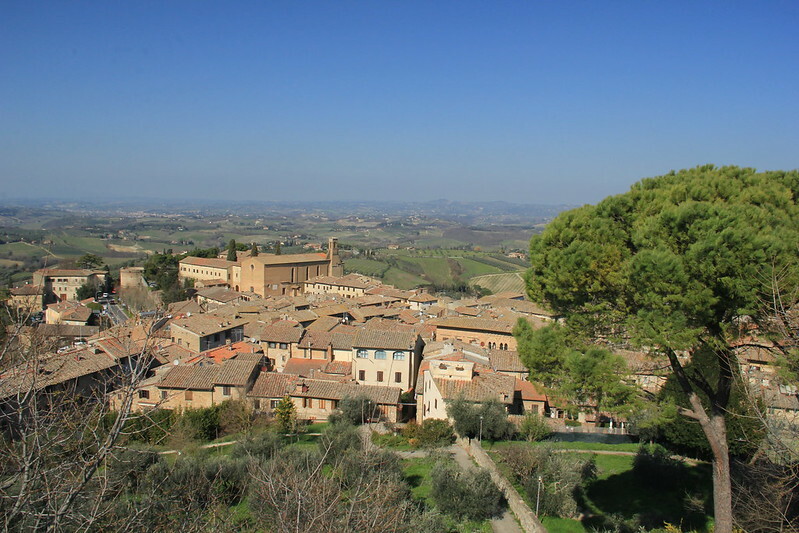 My mum loves Italy and Tuscany was one of the places she’d hoped to visit with my dad. I figured that, after losing the man she was married to for almost 45 years (my dad died just a week before their 45th anniversary), my mum thoroughly deserved a holiday and something to look forward to. She then spent the next few months reading the guidebook I’d also given her, and getting increasingly excited about all the places she’d be visiting all things she was hoping to see and do there. It gave her something to focus on other than the grief she was feeling for the loss of my dad. Seeing as though I moved out of home when I was 18 and hadn’t actually been on holiday with my parents since I was 17, I was a little apprehensive about spending seven days away with mum. 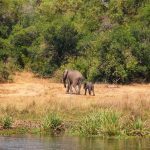 I was also concerned that considering how much more agile, full of energy – and significantly younger – I am than mum, I would (albeit unintentionally) try to keep a pace that was simply too much for mum to handle. 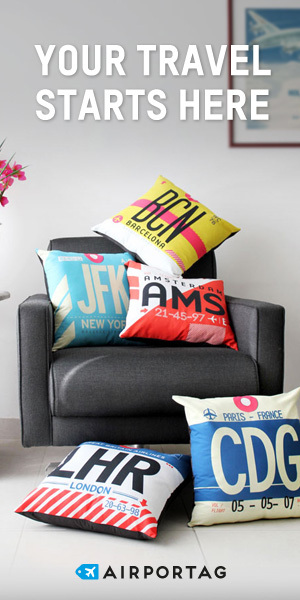 But I get on well with mum, and we’ve always been close, so I hoped that I’d be able to design a holiday that would not only be filled with sights and activities that she loves, but that would also be at a pace that she felt comfortable with. But, I digress. The purpose of this post was (and still is!) 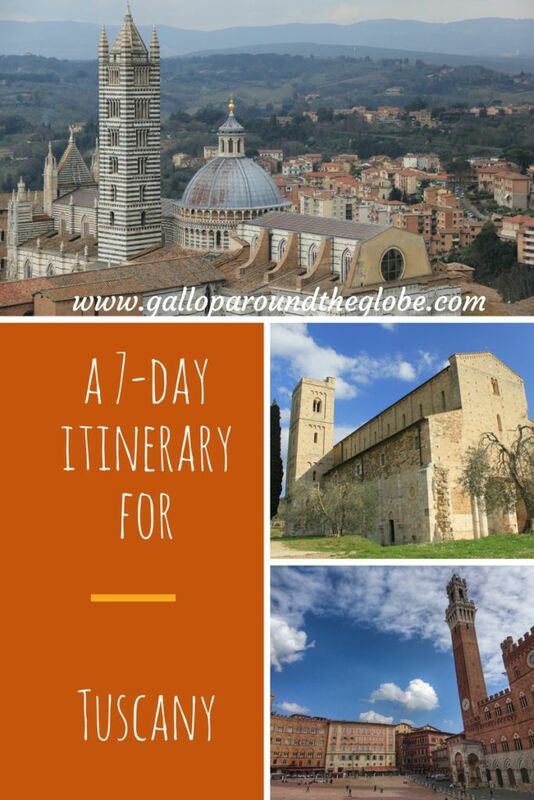 to show you exactly what you can see of Tuscany if you have just seven days to play with. And, as you may have guessed, this isn’t a fast-paced holiday, so there’s plenty of room to squeeze in a little more than we managed to. 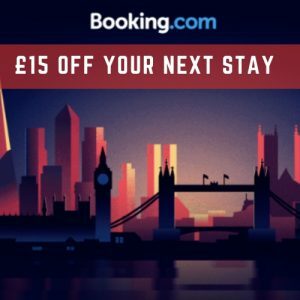 I bagged our return flights with Ryanair via the Skyscanner app for a cost of £40 each from Liverpool. I booked them about four months in advance. Everyone I’d spoken to had advised me to skip Pisa, but as the flights were a lot cheaper to here than to Florence, Pisa was our start and end point of this trip. There are regular buses that make the 1.6 kilometre journey from Pisa’s airport to its central train station (yes, I couldn’t believe how close it was!) for a cost of €2 each. 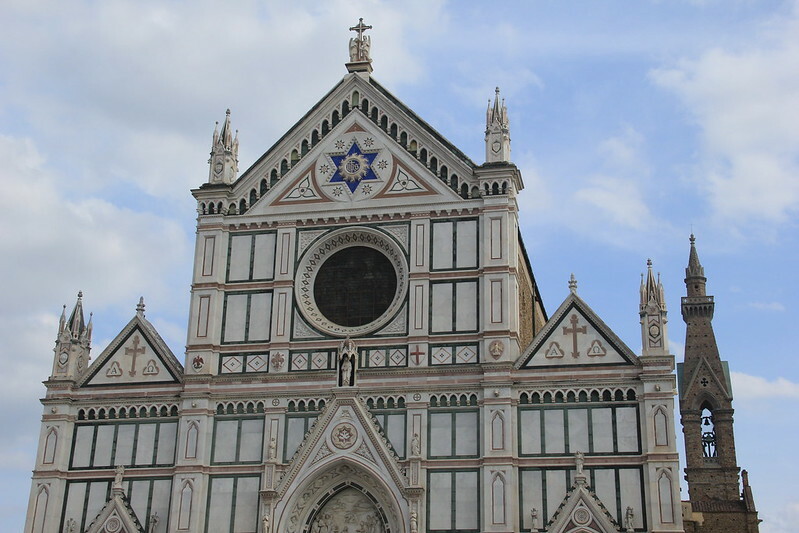 From there several trains an hour run the 60-minute route to Florence’s Santa Maria Novella train station for €8.40 each one-way. 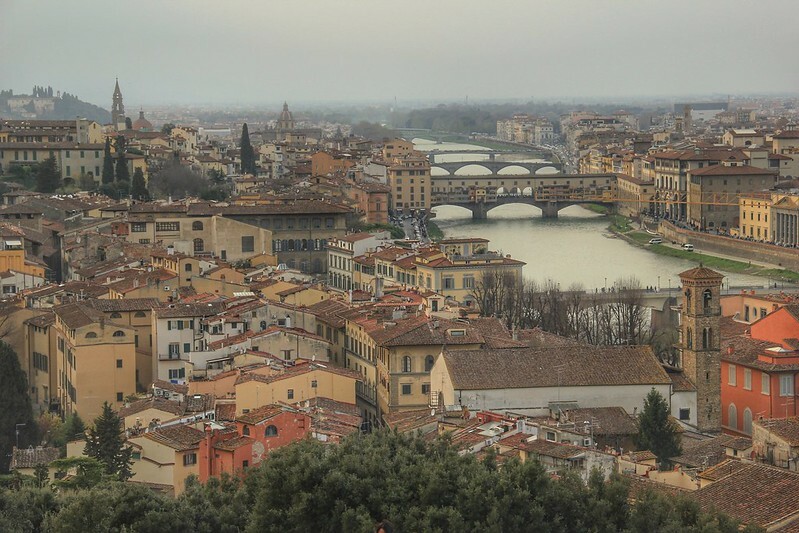 We arrived into Florence around 7pm, and checked into our Airbnb apartment (if you’re not signed up yet, you can get £30 off your first stay using this link) in Santa Croce (my favourite neighbourhood in Florence) before heading out to find a local restaurant at which to grab some dinner. He wasn’t wrong. The lovely gentleman who served us also patiently translated every item on the menu for us. Don’t come to Florence expecting restaurant menus to be available in English; more often than not, they’re not. 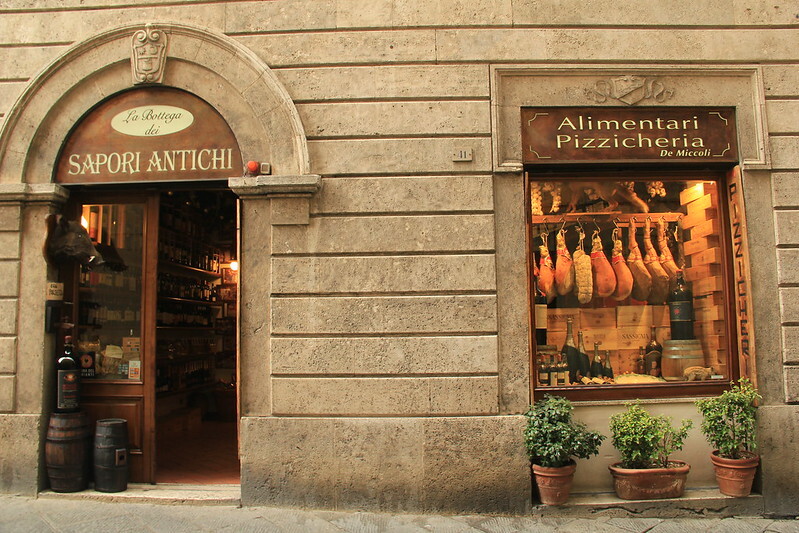 This is one of the places I was most excited about visiting in Tuscany. And we were blessed with (the only one on our trip, mind!) a beautifully sunny day with which to explore it. San Gimignano is a medieval hill town around 52 kilometres southwest of Florence that’s known as “The Town of Fine Towers.” Originally there were 72 towers in San Gimignano, built in aristocratic rivalry by the feuding nobles of the twelfth and thirteenth centuries, but now only 14 of them remain. 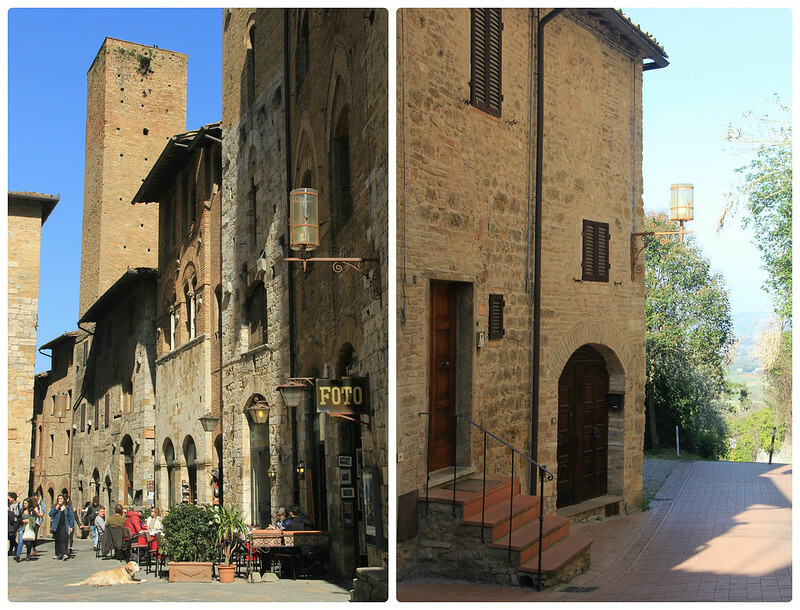 You’ll need to catch a bus to San Gimignano (there are no trains), making a change in Poggibonsi. The journey is 1 hour and 45 minutes long and costs €6.80 for each leg of the trip. The buses don’t run on a Sunday. 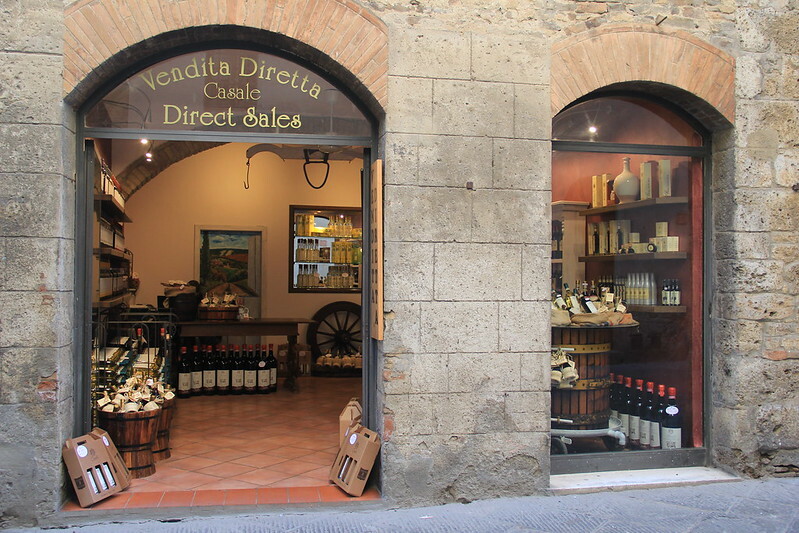 #3 Having a look around the Spezieria di Santa Fina, one of Tuscany’s oldest pharmacies. 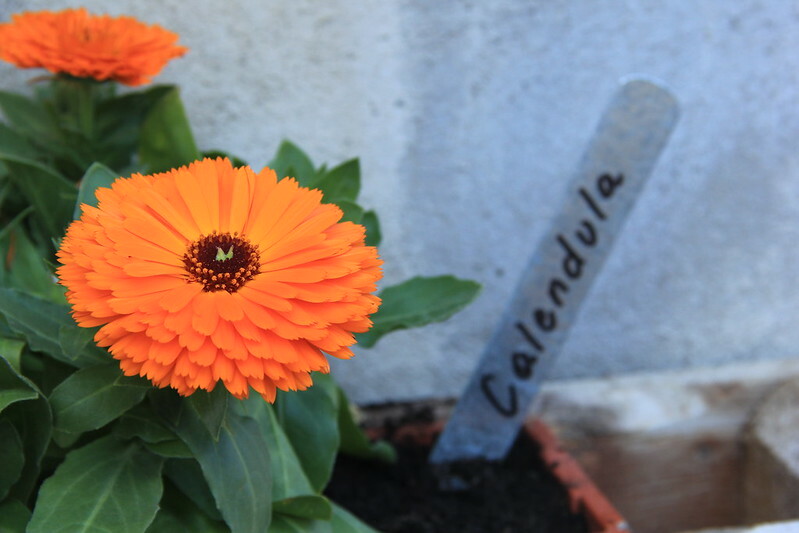 The Speziera di Santa Fina reproduces the layout and original scents of the 13th century pharmacy, and there’s a lovely garden in which herbs are grown and furniture is made out of old pallets. 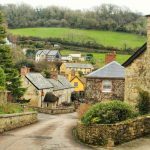 There are more scheduled times but these are the best options to allow you sufficient enough time to explore the town. Note that the Saturday timetable is slightly different; these are Monday to Friday times. 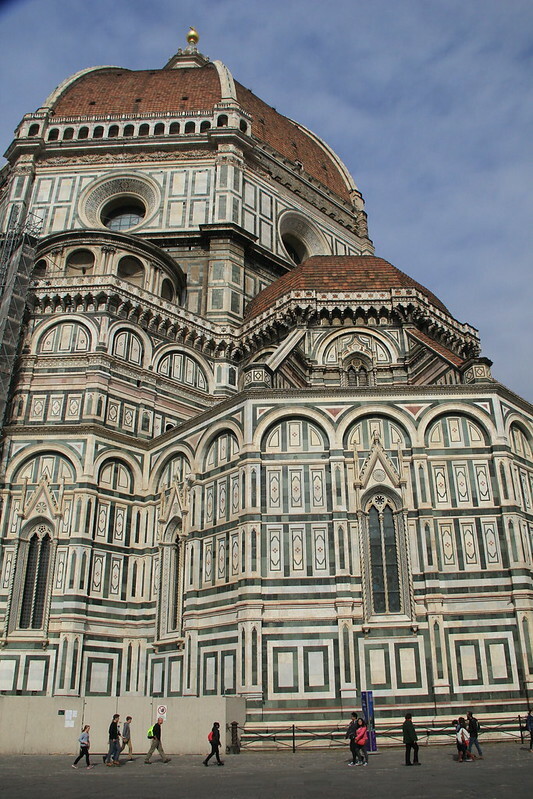 Neither my mum nor I are particularly flush with money (the majority of my trips are completed on a pretty tight budget), or particularly patient when it comes to queuing, so we decided to skip the interiors of Florence’s major sights, in favour of admiring the city’s architecture from the outside. The exception being the €15 (ouch!) 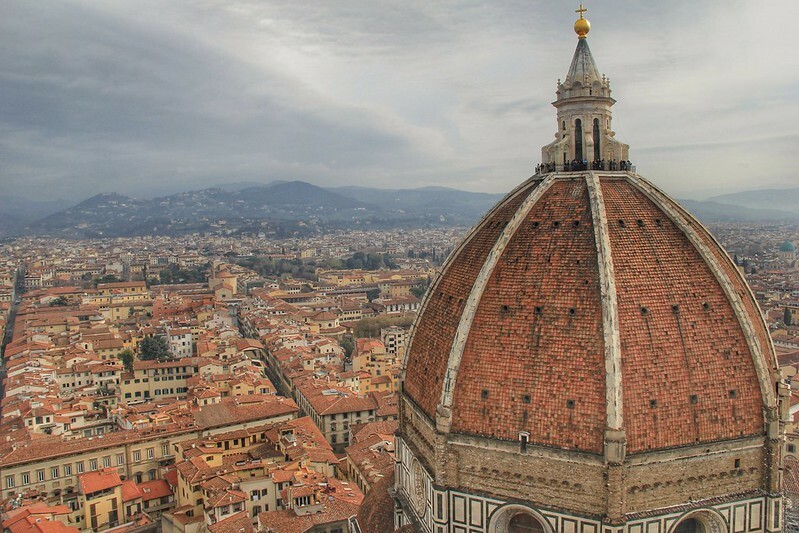 I paid to climb the campanile of Florence’s famous Duomo, because I wanted to capture the iconic dome shot over the city. Unfortunately it was pretty cloudy when I did so, and there was scaffolding covering a large chunk of the cathedral to the right of the dome, but nevertheless it was still a pretty spectacular sight to behold. Plus, I didn’t have to queue (yay for visiting at 9am on a Saturday morning right after St. Patrick’s Day celebrations!). #1 Wandering around the exterior of the immense and incredible Duomo in the early morning before the hoards of tourists arrive. Even in March you cannot escape them it seems! 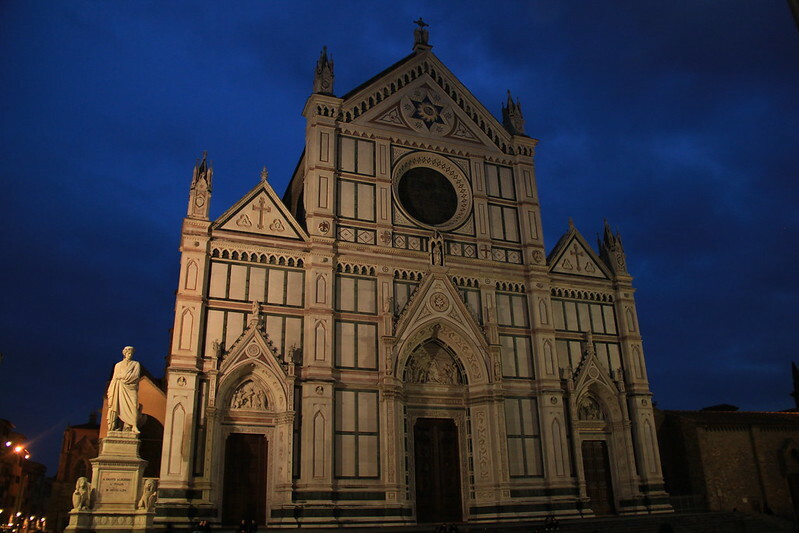 #2 The Basilica di Santa Croce. 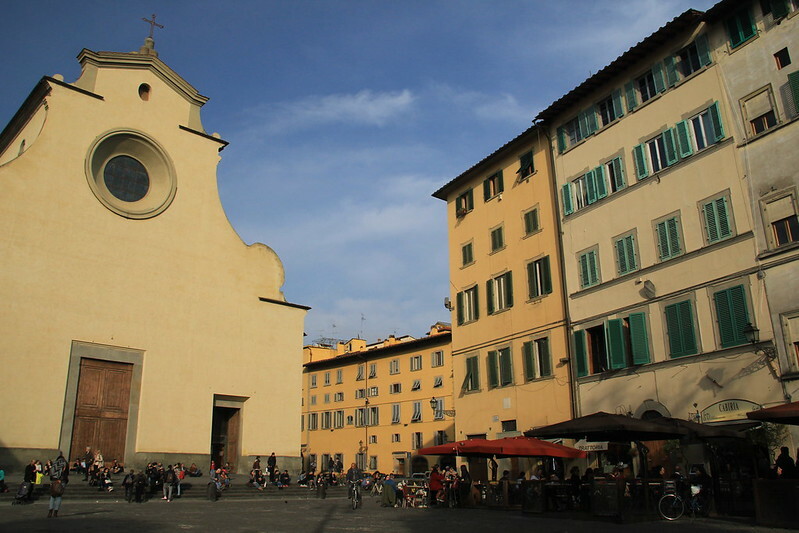 Located at one end of the spacious Piazza di Santa Croce, this ornate-fronted church was literally around the corner from our apartment. 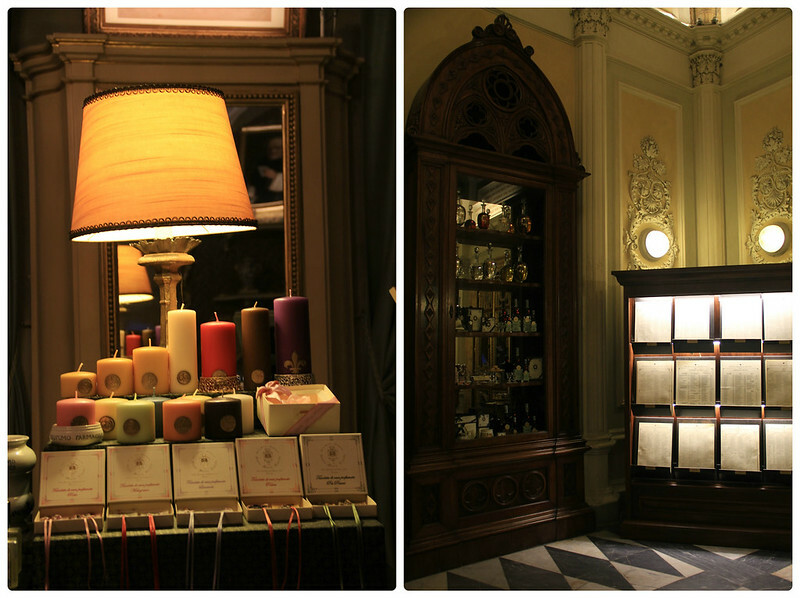 You’ll find erboristas throughout the city but the Officina Profumo Farmaceutica di Santa Maria Novella is something else. With beautifully decorated high arched ceilings and chandeliers, there are multiple rooms to explore here, selling beautifully packaged soaps, perfumes, herbal remedies for various conditions and ailments, and even scented shampoo for your cherished four-legged friend. 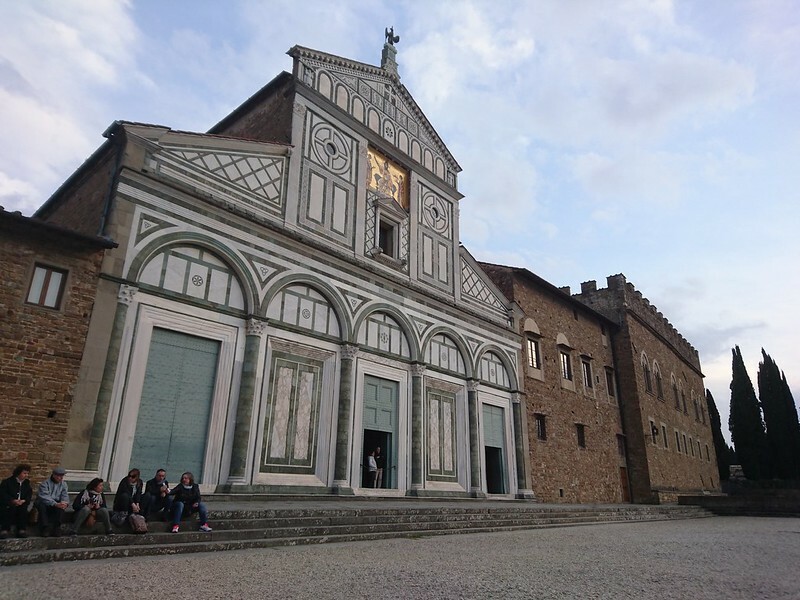 #4 A climb up to the Basilica di San Miniato al Monte at dusk. Everyone tells you that Piazzale Michelangelo is THE place to watch the sunset over Florence but in my opinion the views from the Basilica di San Miniato are just as good, and there are far fewer people. It’s also free to enter the basilica, and it’s utterly beautiful inside. #5 The Mercato di Sant’Ambrogio. I didn’t actually visit Florence’s Mercato Centrale so I’ve no means of comparison, but I’m told the Mercato di Sant’Ambrogio has a more local flavour than its larger sibling. Saturday is the best day to visit, when farmers travel here from around the region to sell their produce. 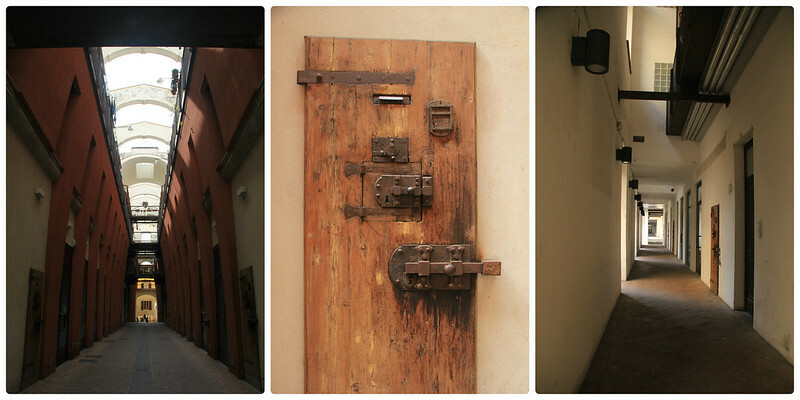 #6 Florence’s old city jail (1883-1985) has now been partially converted into flats (how would you feel about living in a former prison cell?) 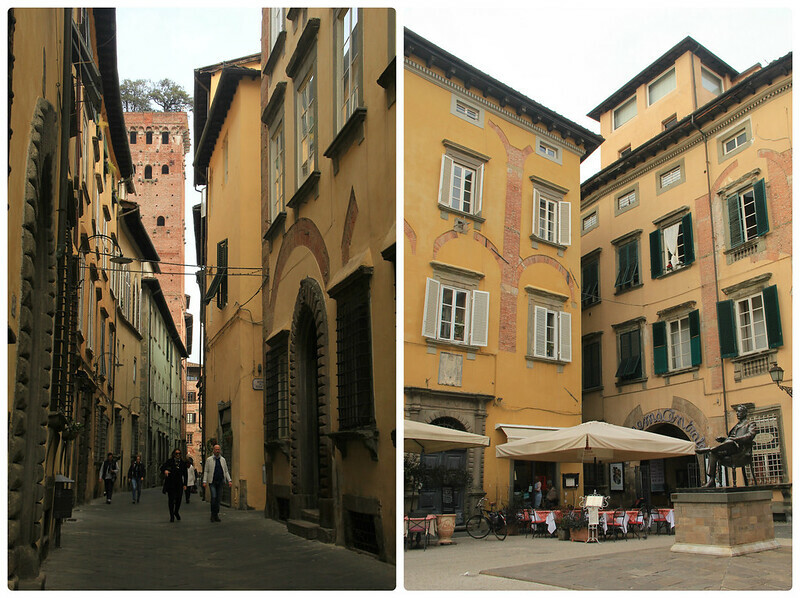 and the courtyard and surrounding buildings play host to a number of Florence’s cultural events. 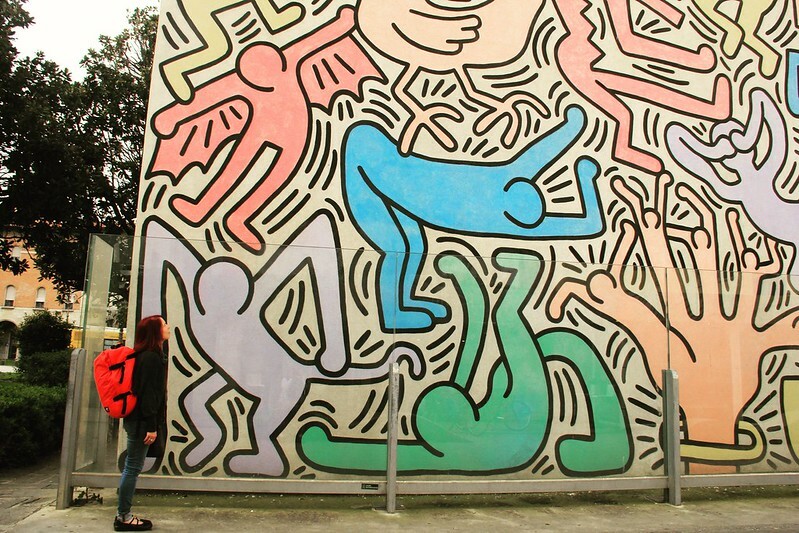 Although there didn’t seem to be a lot going on when we visited (low season/wrong time of day? 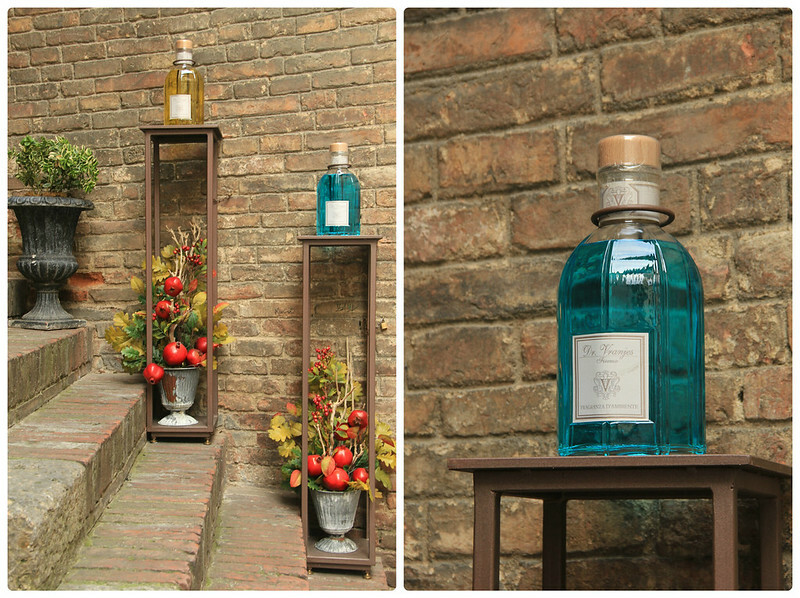 ), we loved Le Murate Caffé Letterario, a buzzing cafe-bar and art space that’s frequented by Florence’s bohemian crowd. 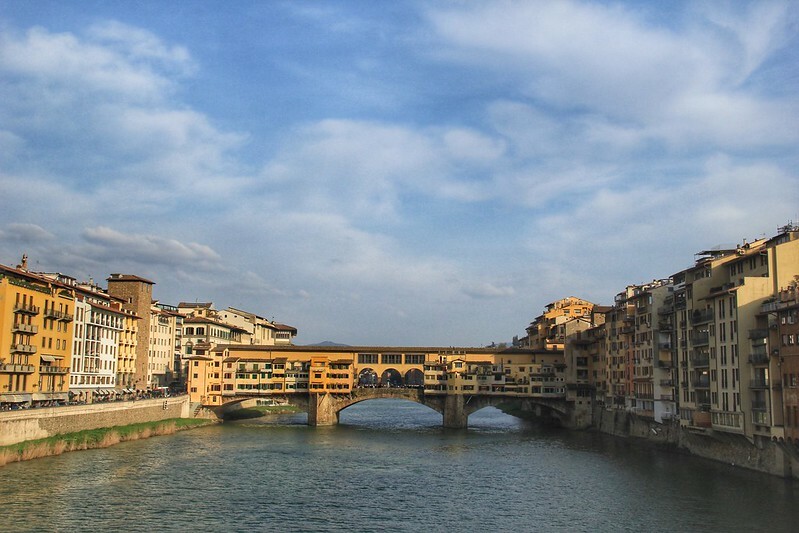 #6 A wander along the River Arno to marvel at Florence’s iconic Ponte Vecchio. Yes it’s probably the most touristy activity in Florence (along with visiting the Duomo), but the bridge does have a certain colourful, rambling appeal. 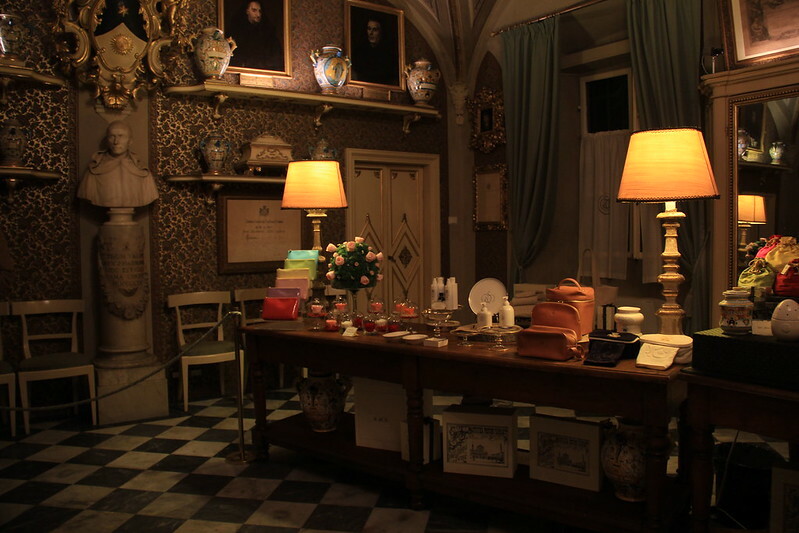 Located over the opposite side of the Arno to Florence’s major sights, Oltrano is the traditional home of the city’s artisans. 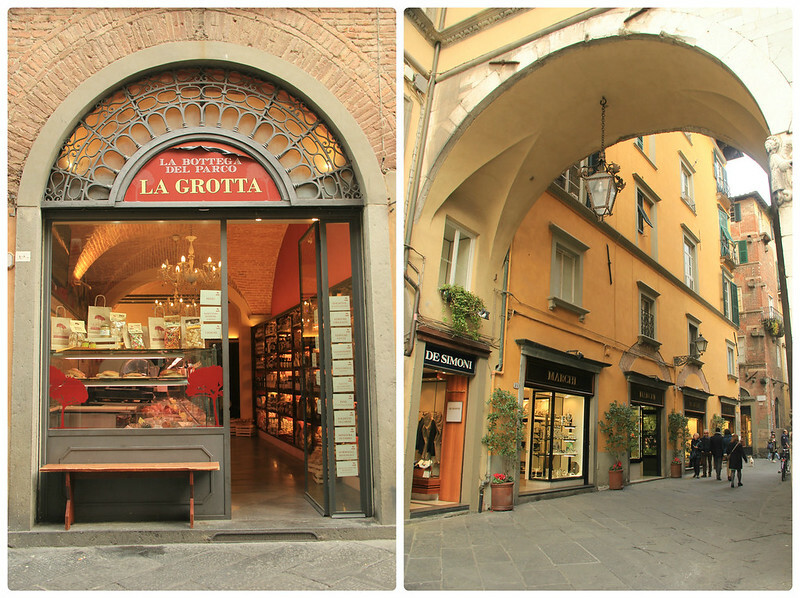 Although many of the original workshops have become designer boutiques (with prices to match), the streets here make for a peaceful wander (away from the Ponte Vecchio), and the Piazza Santo Spirito is a great spot to take a coffee break and watch the world go by. The easiest way to get to Lucca (pronounced “Luka”, not “Lucha”) is by train (these also run on a Sunday, which is when we visited). We caught the 10:10 train there and the 17:31 (although we did get on the 16:31 originally; story to follow in another blog post!) train back. Both were direct trains and cost €7.50 one-way. 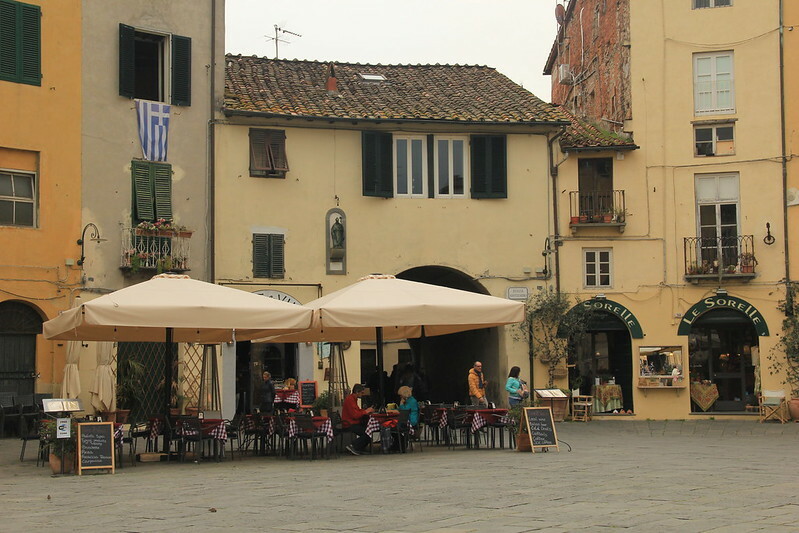 Encircled by an imposing ring of tree-lined Renaissance walls that you can walk or cycle along, Lucca is situated in a fertile plain near the Tyrrhenian Sea, part the way between Pisa and Florence. 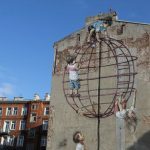 Its tall buildings and largely traffic-free (save for the odd push bike) narrow, cobbled streets mean that its the perfect place for an aimless wander. 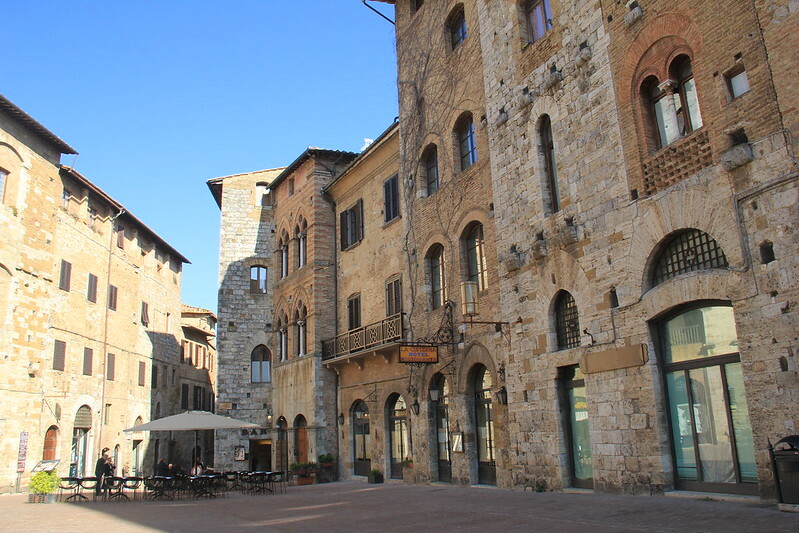 Built on the ruins of an ancient amphitheatre that dates back to the second century, Piazza Anfiteatro is a completely round piazza that’s surrounded by shops and restaurants and is accessed via a series of arched passageways. 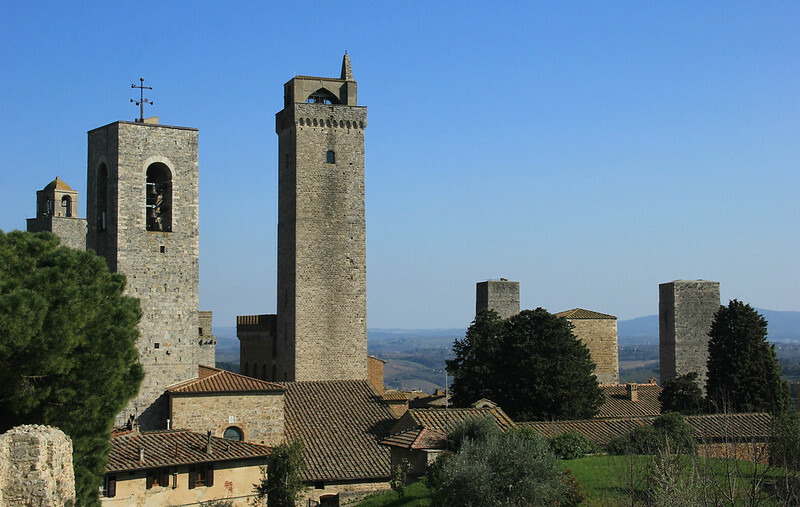 You’ll need to jump on the same bus that you caught to Poggibonsi in order to get to San Gimignano, as this bus continues on to Siena. 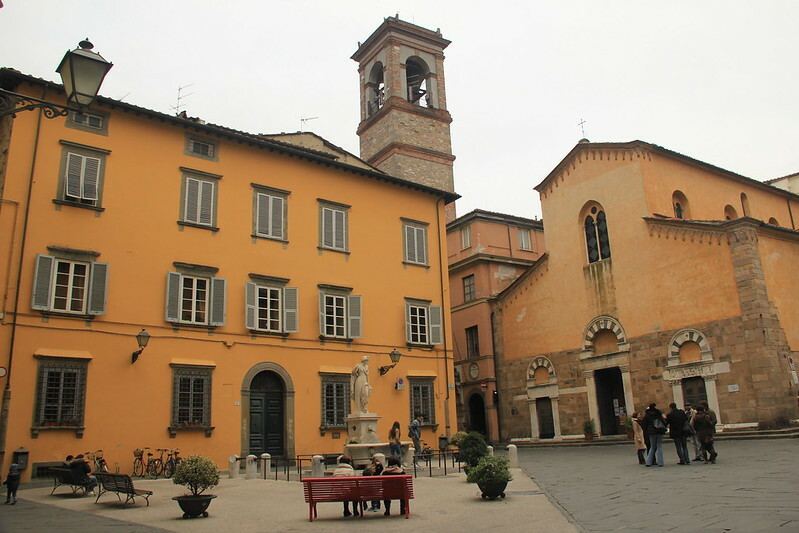 We caught the 11:40 bus, which dropped us into Siena at 13:15. 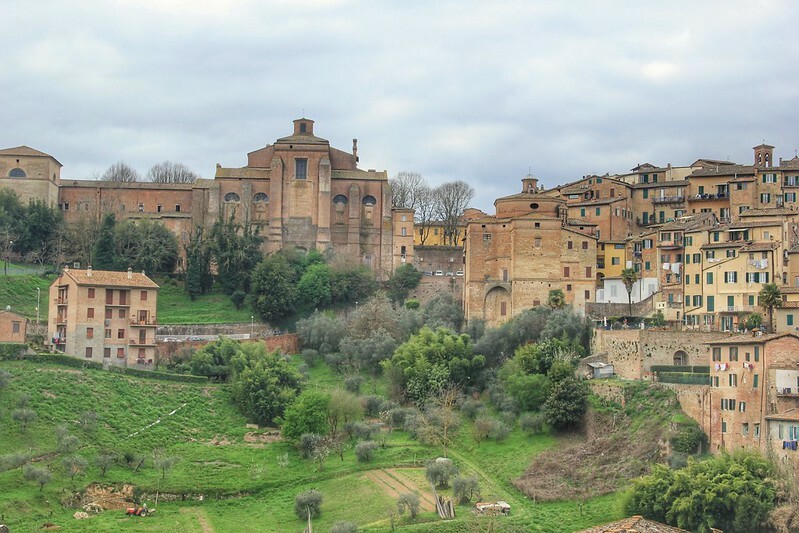 Siena’s bus station is literally minutes on foot from its centro historico but depending on where you’re staying in the city, you may have to lug your suitcase or carry your back pack up and down a lot of steps (Siena is hilly!). 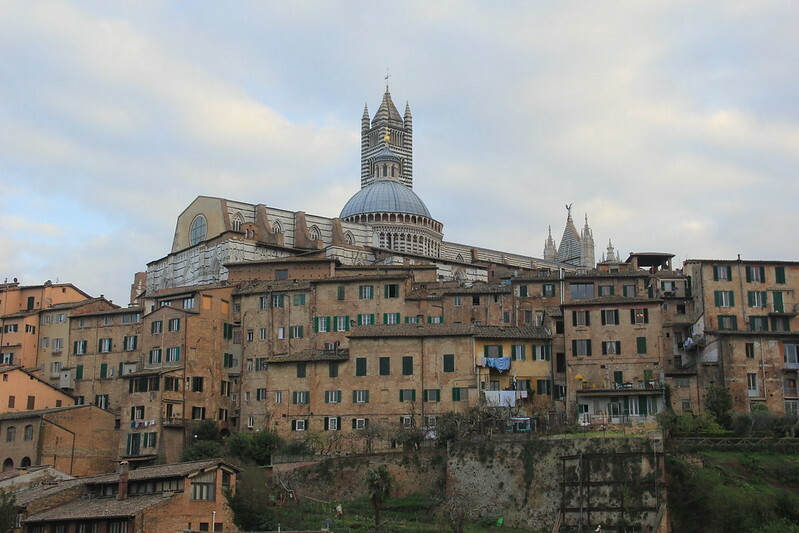 We didn’t believe him until we opened the shutters to our balcony and gazed out across the valley to Siena’s crowning glory: its Duomo (cathedral). With a little sunshine and some blue skies, it would have been perfect. 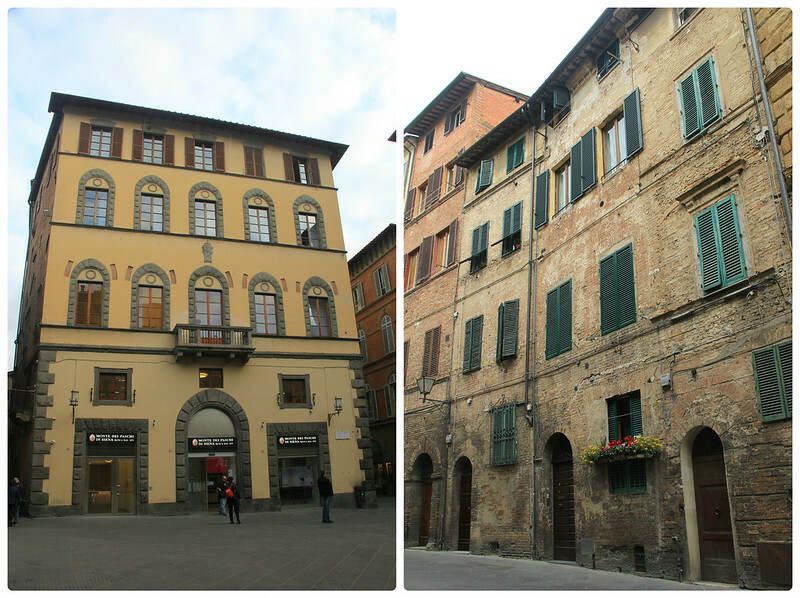 Aside from San Gimignano, Siena was my absolute favourite place in Tuscany. 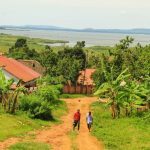 Its historical centre – declared a UNESCO World Heritage Site in 1995 – is compact and can easily be explored in a day, but that said I’m still glad I chose to spend two nights here. #1 The Piazza del Campo. 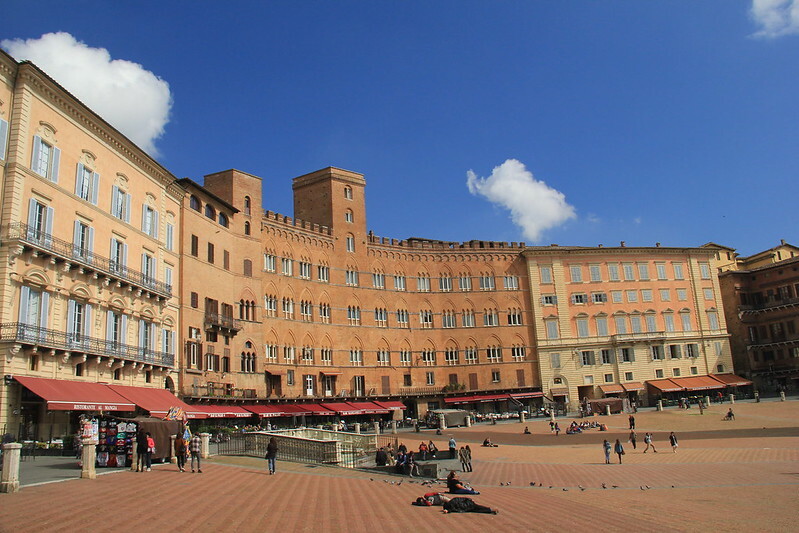 A beautiful sloping piazza whose centrepiece is the Palazzo Comunale, a 13th century Gothic building that boasts the tallest tower in all of Tuscany. 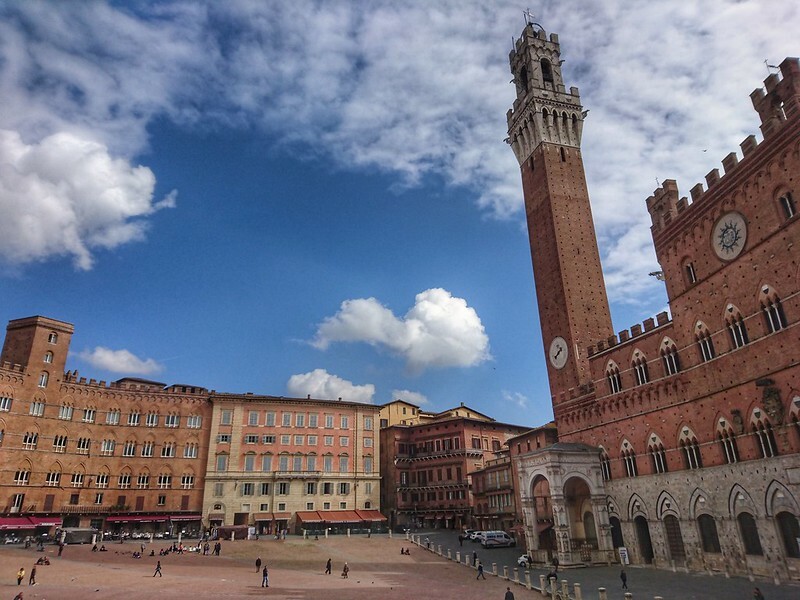 Torre del Mangia (pronounced “Manja”) stands 102 metres above Siena’s Piazza del Campo and – even on a cloudy day – the views from the top are incredible. 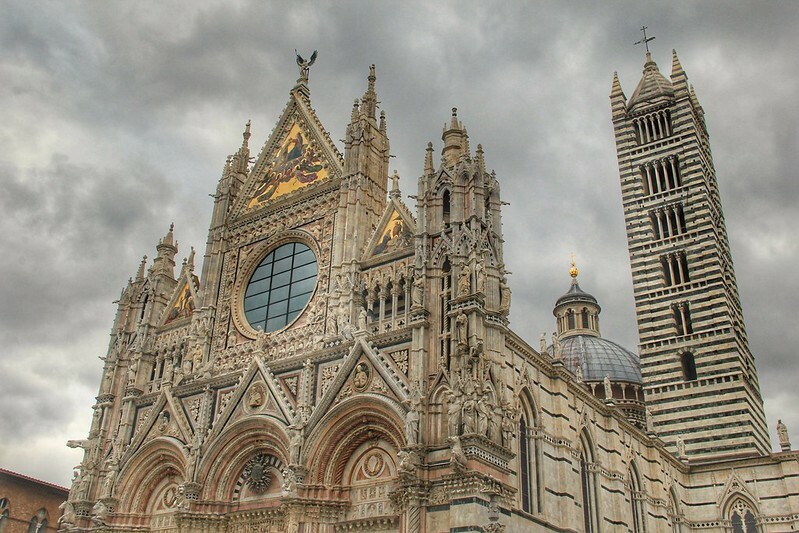 Standing at the highest point in the city, Siena’s Romanesque-Gothic cathedral dates back to 1215. Over the years many of Italy’s great artists (including Michelangelo and Donatello) have contributed to its construction and design. #3 A meal at Nonno Mede. 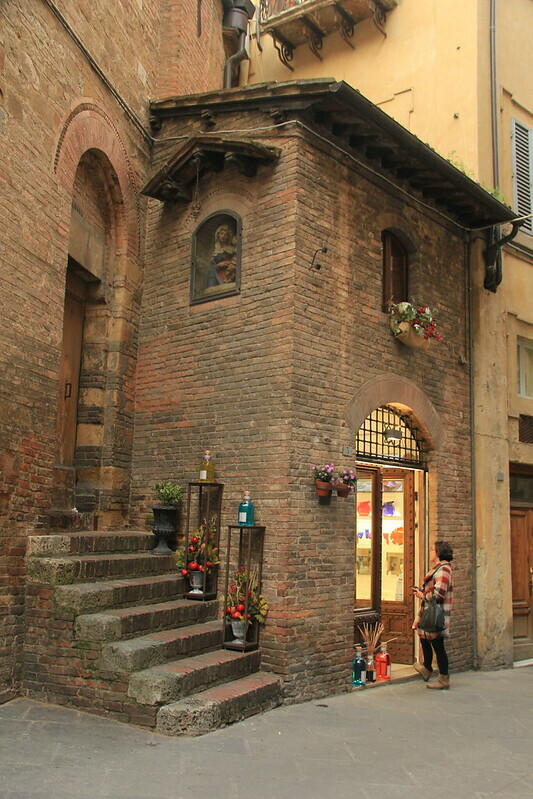 Located off the beaten tourist path, on the same road at our hotel, we loved Nonno Mede so much we ate here twice. 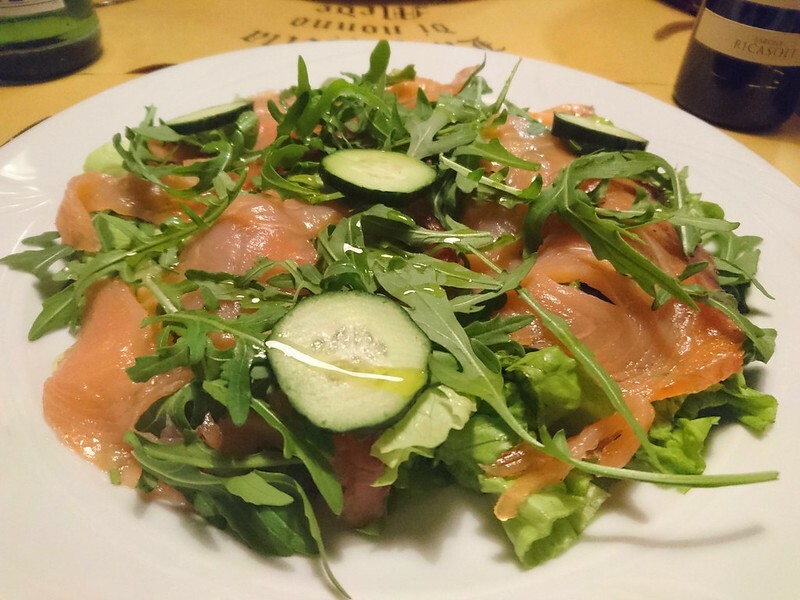 Compared to most restaurants in Tuscany the food here is really reasonably priced and absolutely delicious. 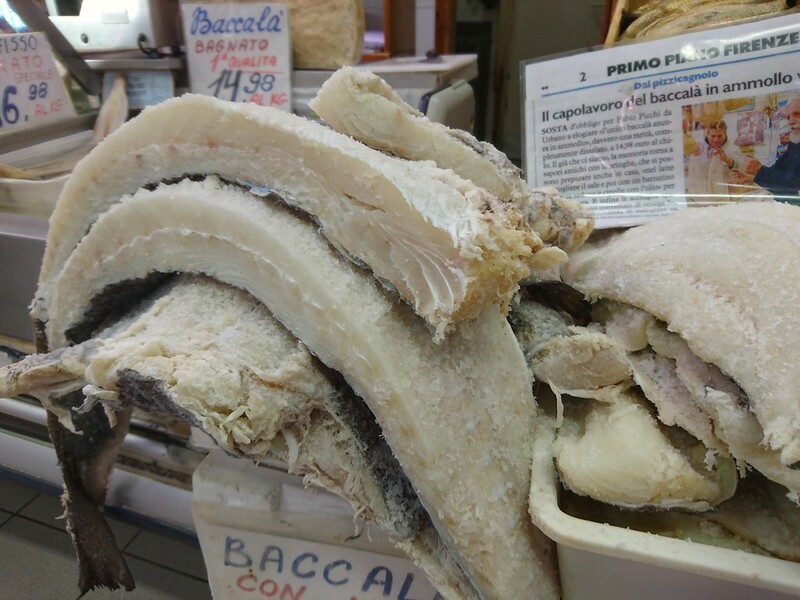 Try the trio of smoked fish or the Pici (a type of pasta local to the area) with pecorino cheese (again, local to the area) and black pepper. #4 An aimless wander through the city’s beautiful streets. 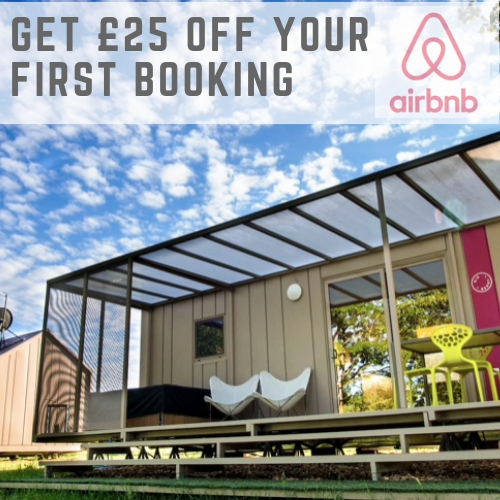 Pick up a map from your hotel or the tourist office, and make sure you’ve got one loaded on your phone as well before you set off. That way you’ll know where you are at any one time, as many of Siena’s smaller streets either do not have visible street names or are not marked on the map. I left mum window shopping and coffee drinking in the morning, whilst I went on a bit of a hike around the city with my camera. We then we met at La Lizza Cafe (great place to pick up cheap coffees and paninis) at 12:30 in order to pick up our Viator tour at 1pm. Although we’d paid for a group tour, what we actually got was a private tour for the same price (one of the benefits of travelling low season). 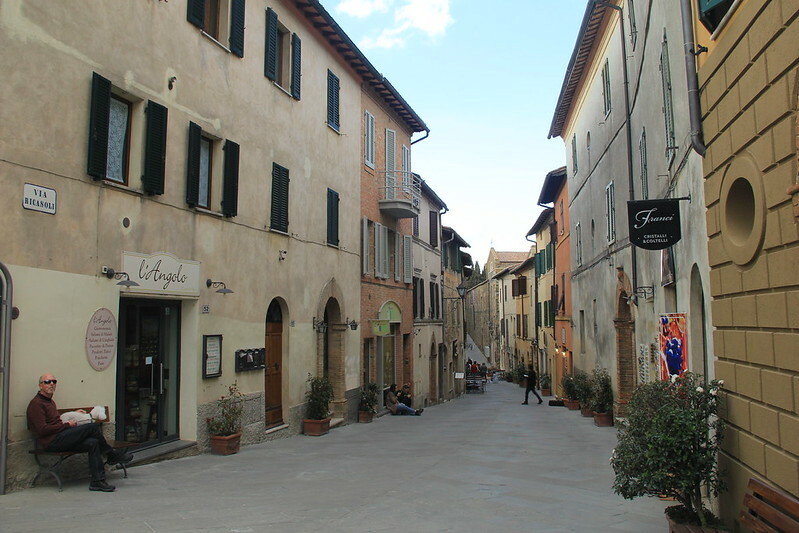 Our guide (also our driver) drove through the streets of Siena’s historic centre, imparting a little of the city’s history to us, before picking up the road that would lead us south towards Montalcino. 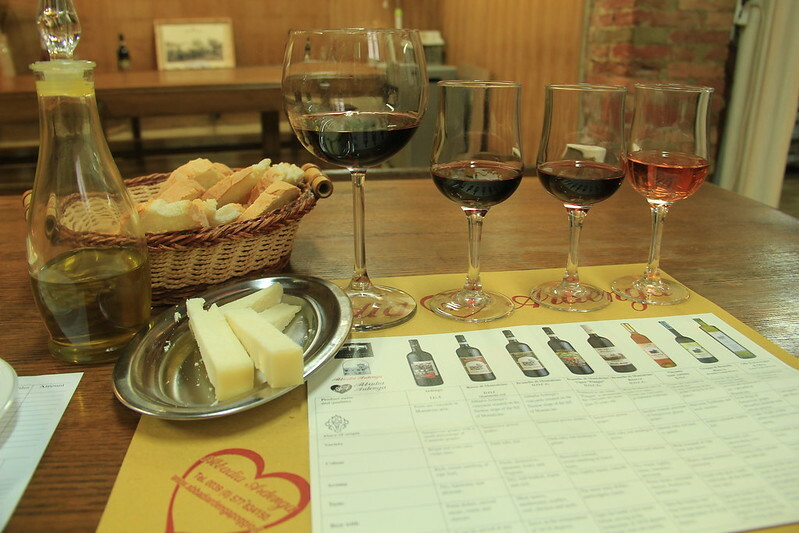 #1 A visit to a winery to learn about the Brunello di Montalcino wine production and to sample some wines and cheese. We were shown around the Abbadia Ardegna winery by 85-year old Mario, a vivacious man with a fondness for women and wine. You won’t be allowed to leave until he’s had at least one dance with you. 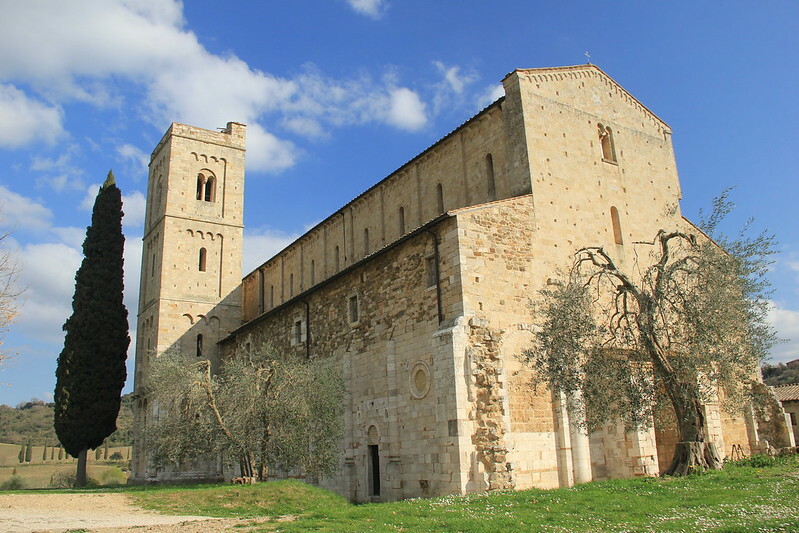 #2 A stop at the beautiful, Romanesque Abbazia di Sant’Antimo, located in an isolated valley just below the village of Castelnuovo dell’Abate. The sun came out just in time for our arrival. 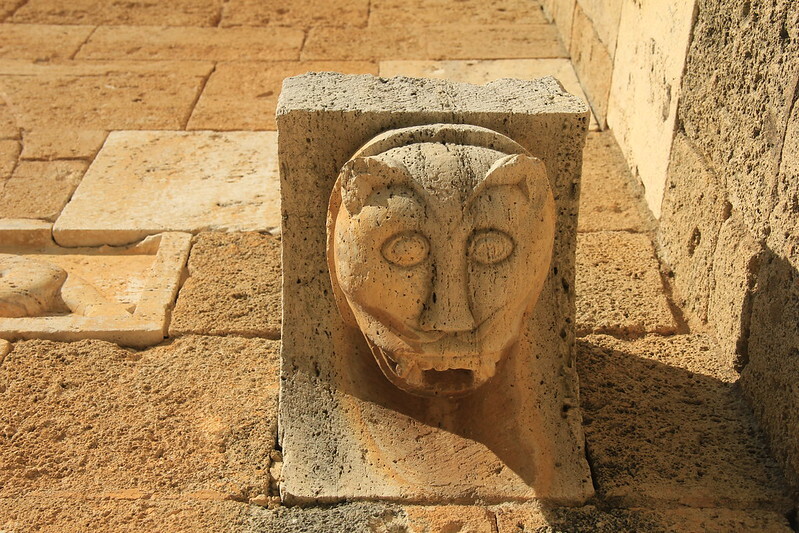 The monastery was founded in 781 and monks still perform Gregorian chants here during the daily services. 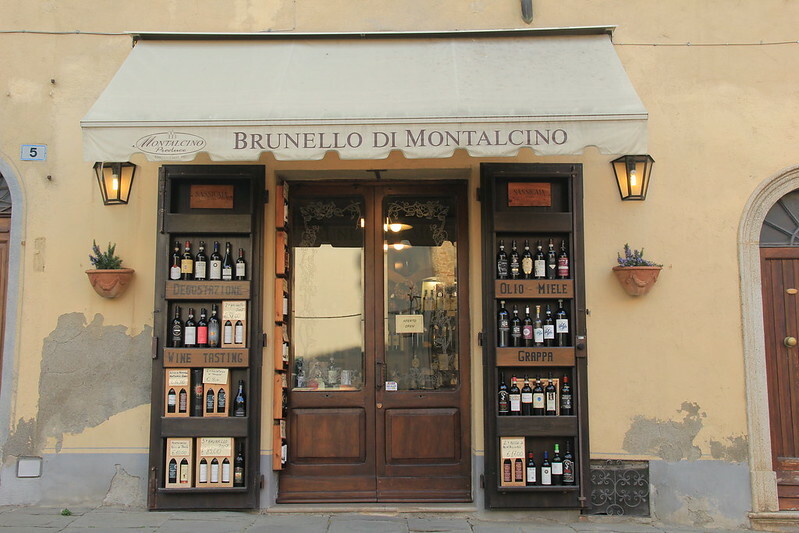 #3 A free hour to wander around the town of Montalcino, home to the world famous wine, Brunello di Montalcino. 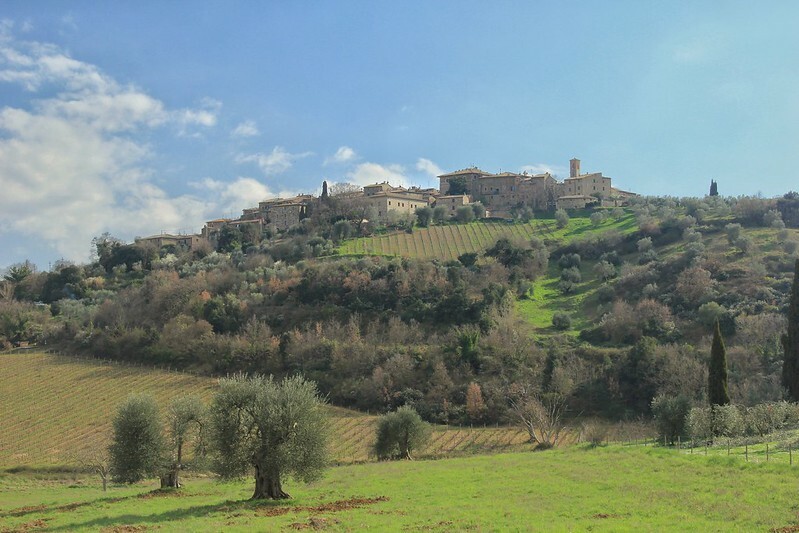 Montalcino was also the last stronghold in the battle against Florence. It held out for a further four years once Siena had fallen. The only reason we were heading back to Pisa was in order to fly back to Liverpool from there the next morning. 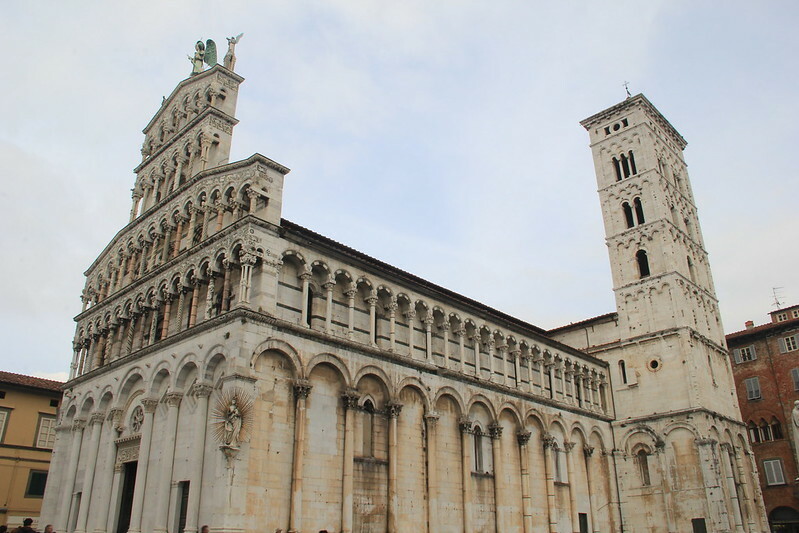 However we felt it would be criminal to come to Pisa and not see the Leaning Tower. 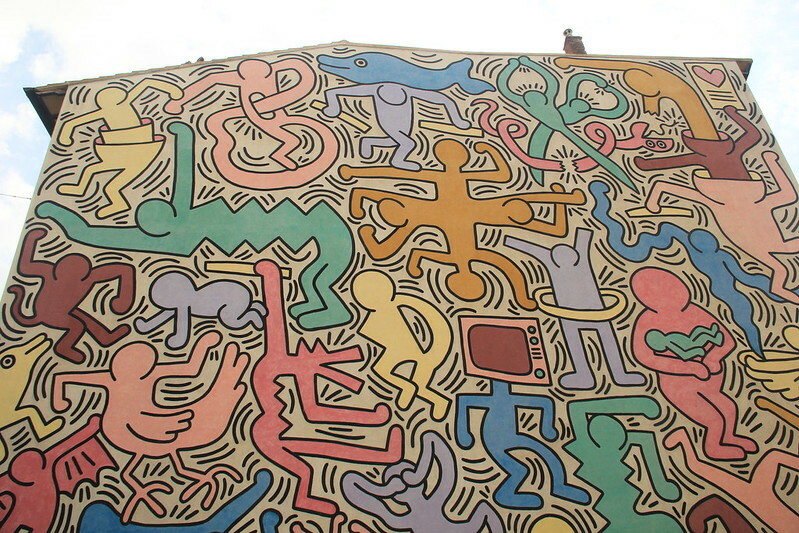 So we caught the 11:18 train (there are no buses from Siena to Pisa; you have to go via Florence), which got us into Pisa at 13:03 – just enough time to marvel at Keith Haring’s “Tuttomondo” mural and grab some lunch at the adjacent cafe (appropriately named “Keith”) before checking into our hotel at 3pm. 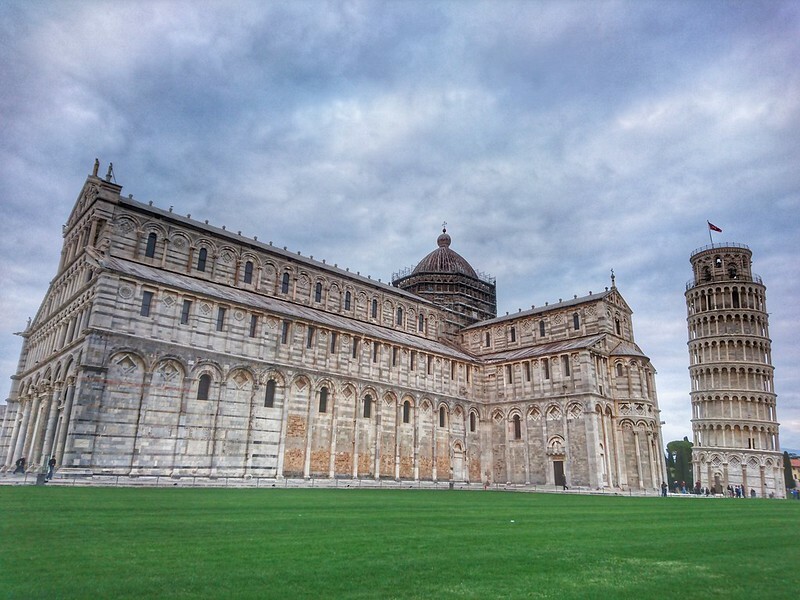 As soon as we’d checked in we took a leisurely stroll across the railway line towards Piazza del Miracoli (the location of Pisa’s Duomo, Camposanto, Battistero, and Leaning Tower) and the city’s centro historico. And I managed to (unintentionally) take the only photo of the tower in which it looks almost upright. 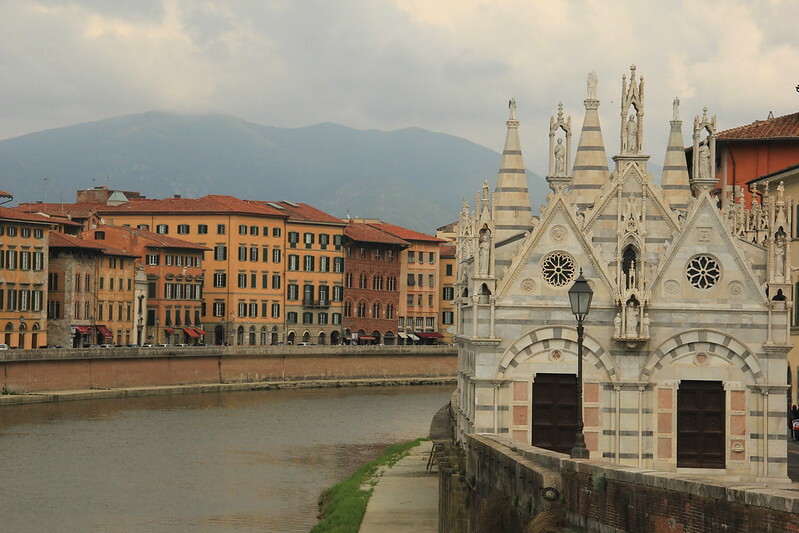 Compared to all the other towns and cities we’d visited on our trip, Pisa was a bit of a let down to be honest. I appreciate that I only wandered around for an hour or so and therefore am not really qualified to properly judge, but my first impressions were of a run down and unspectacular city where I didn’t feel entirely safe. 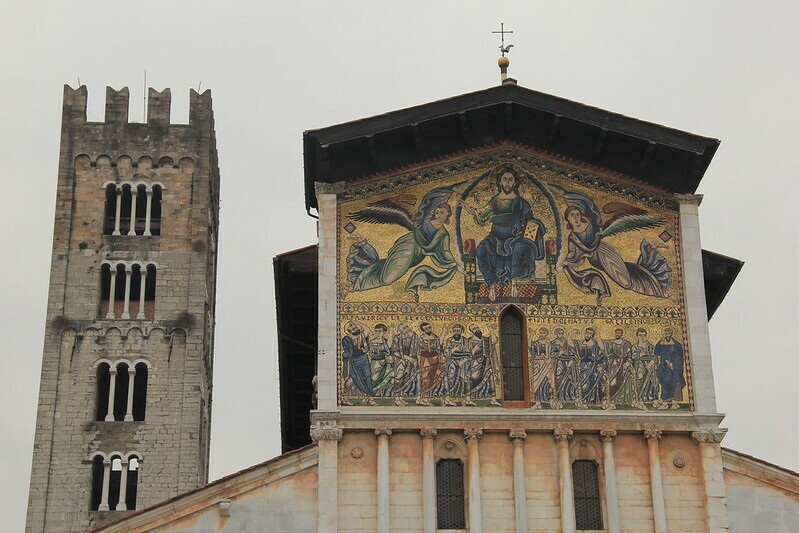 Unfortunately, due to the time of our flight the next day, we had no option but to stop in Pisa overnight the evening before, but if I had a choice I probably would have skipped Pisa altogether (save for the Tuttomondo mural; THAT was cool). 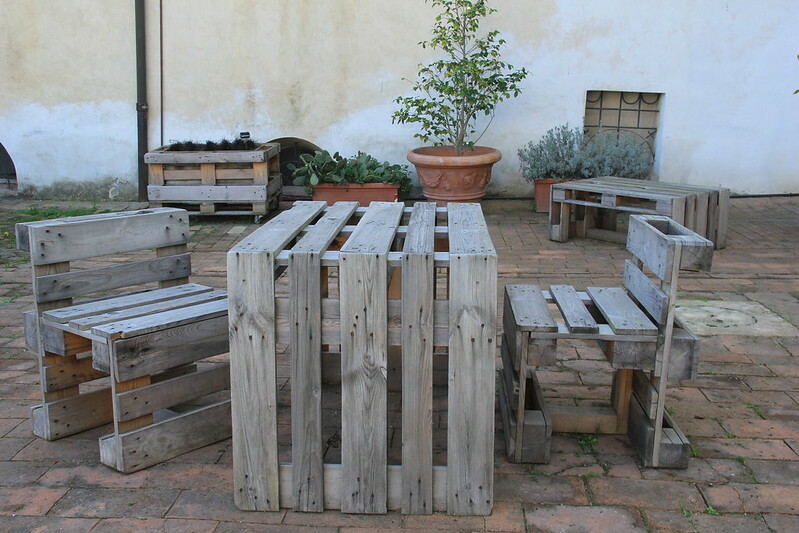 Tuscany isn’t cheap. In fact it’s downright expensive! 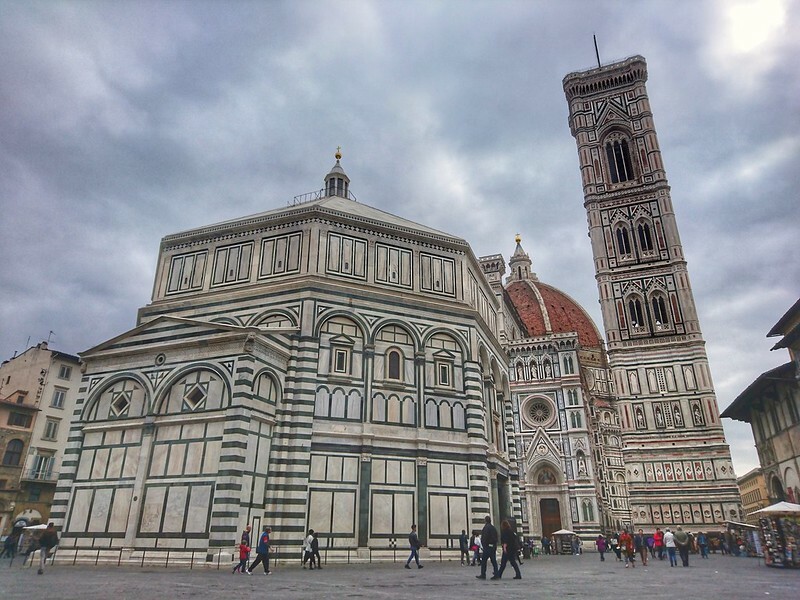 We saved a lot of money by not paying to go inside the majority of tourist attractions, and by having an apartment for our four nights in Florence, so that we could cook our own meals in the evenings. If you do want to eat out though, I’d advise you have your main meal at lunchtime; it’s a hell of a lot cheaper. The entrance fees were just for me (my mum wasn’t up to climbing towers) but otherwise these are costs for two people for one week. 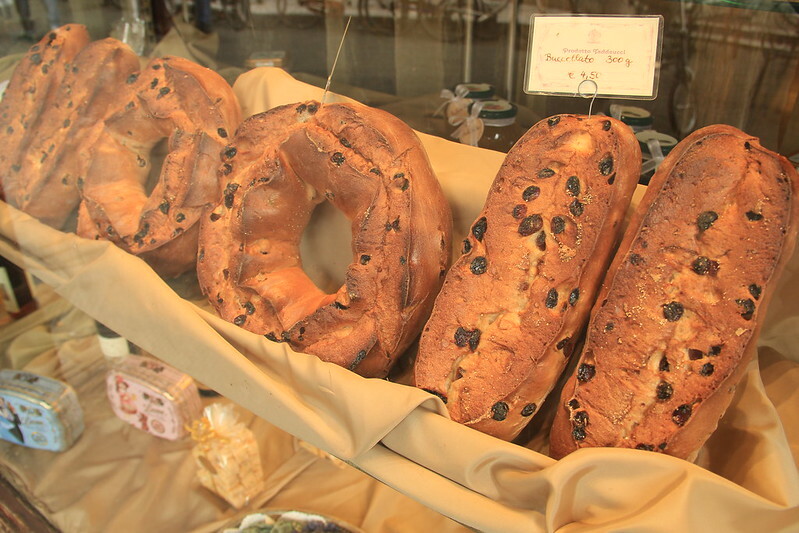 Oh I just LOVE Italy, and Tuscany is probably my favourite region! Hoping to head back there at some point this summer. It’s definitely up there as one of my favourite parts of Italy, too 🙂 Although I haven’t made it to the lakes yet, or anywhere in southern Italy, so still lots left to explore! I’m so glad that Siena was one of your favorites! 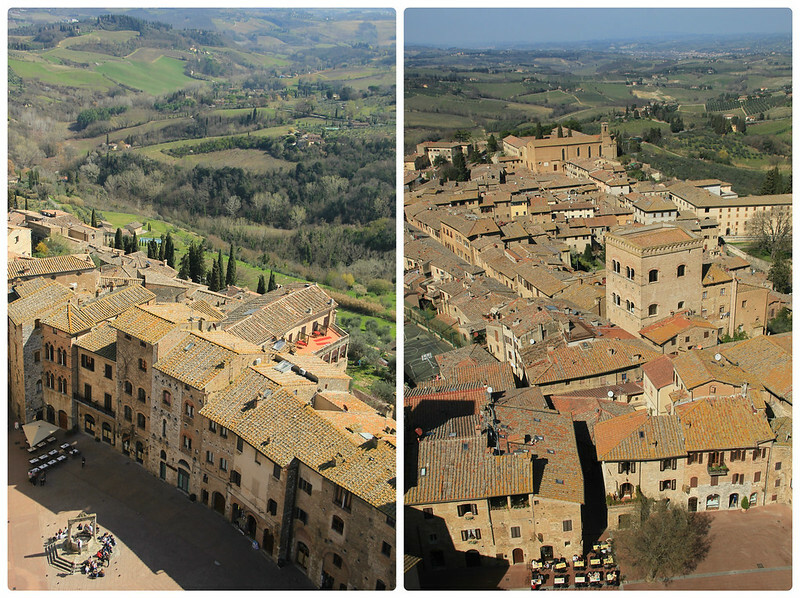 We’re opting to visit Siena over Florence and have had some people think we’re crazy. 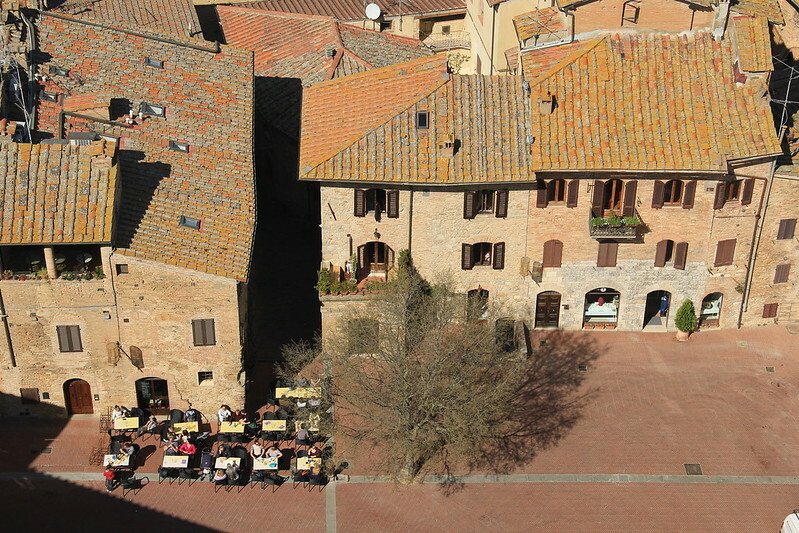 I’ve just heard so many good things about Siena that I felt that we would enjoy our time more there. Thank you for sharing this! 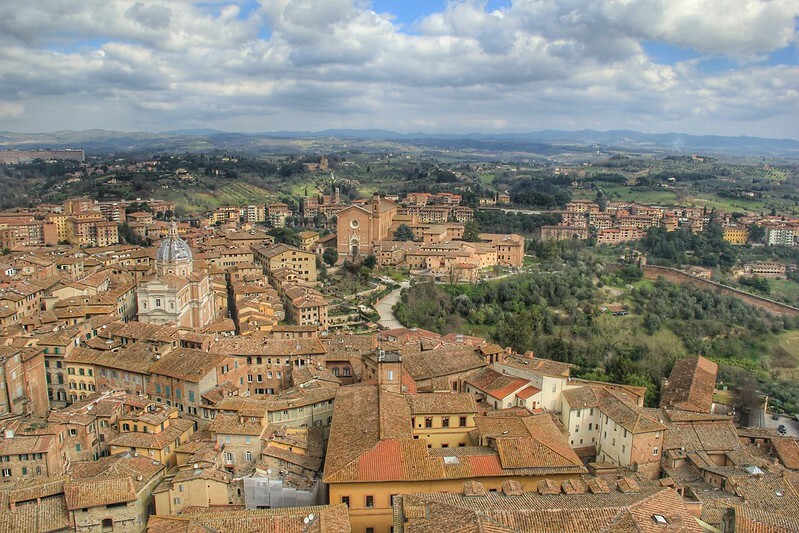 I can’t wait to visit the Duomo and get lost in the streets of Siena. This looks like such a great Tuscany trip. Your pics are GORGEOUS! I was in this region over ten years ago and thinking of going back this summer so pinning this for a guideline!! 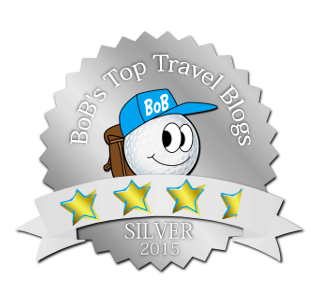 What a fantastic looking trip! I’m sorry for the tragedy in your life, but I think it’s an amazing thing you did taking your mum on this trip. I particularly loved all your photos! Siena looks fabulous! I’m so glad you and your mum had a good time. I had a lump in my throat reading about your dad last time, and it’s so nice to see that you and your mum were able to do something together like this. And your photos are absolutely stunning! 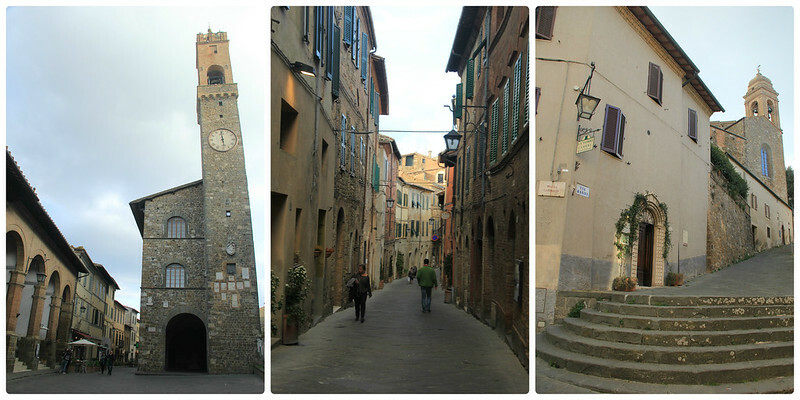 Tuscany looks like it was a great place to visit and. So many nice inspiring photos to look at as well. Thanks for the great post and I’m sorry for yours and your mothers loss. Thank you for your condolences Mike. I’m sure my dad was there in spirit 🙂 He was a huge advocate for public transport so he would’ve been impressed that we were making good use of the local trains and buses! The views are stunning. 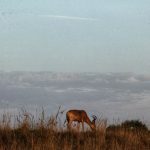 Love your photos Kiara, just amazing.